CLARIN ERIC is happy to announce the CLARIN Annual Conference 2019 and calls for the submission of extended abstracts. 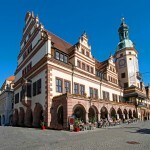 CLARIN Annual Conference 2019 will take place 30 September – 2 October in Leipzig, Germany. Submission deadline: 15 April 2019. Read the full Call for Abstracts.